A match made in heaven for the AK74 and clones; this stuff was literally made for these rifles. It’s so well suited to the cause that you won’t be able to stop grinning from ear to ear as you shoot hundreds of rounds without crying about your wallet getting lighter. 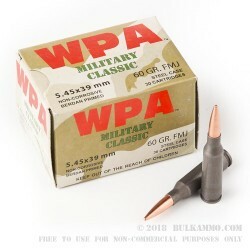 The WPA Military Classic 60 grain FMJ 5.45x39 ammunition is a fun round to shoot with its low recoil, great price and excellent reliability. Like other steel shells: it prefers to be shot out of looser tolerance guns with aggressive extraction/ejection cycles and heavy springs. The Berdan primers also like heavy firing pin hits, but they reward your pin hits with impeccable reliability. Technically you could reload these if you tried hard enough, but the steel casing, Berdan primer and the ridiculously low cost make it better to leave them where they lay. This load is not quite as cheap as the old “SPAM CANS” were in their heyday, but it’s really close and the stuff was practically born to be slung out of an AK/variant. Suitable for use in all 5.45x39 rifles. 30 rounds per box and 25 boxes give you 750 rounds of enjoyment. Q: Is this ammunition corrosive or non-corrosive? 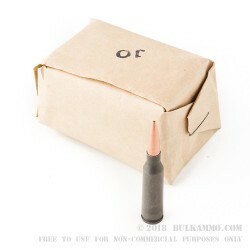 A: The Wolf 5.45x39 rounds are non-corrosive.